Sixty years ago, on 13 July 1958, Philip Tonkin founded a legal practice in the sleepy seaside town of Woy Woy on the New South Wales Central Coast. Then called P.D Tonkin & Co., the world was a different place – television had been in Australia for only two years, the world watched as the USA and Russia raced to launch the first man into space, and P.D Tonkin & Co. had just one secretary, with Phil being the sole legal counsel. 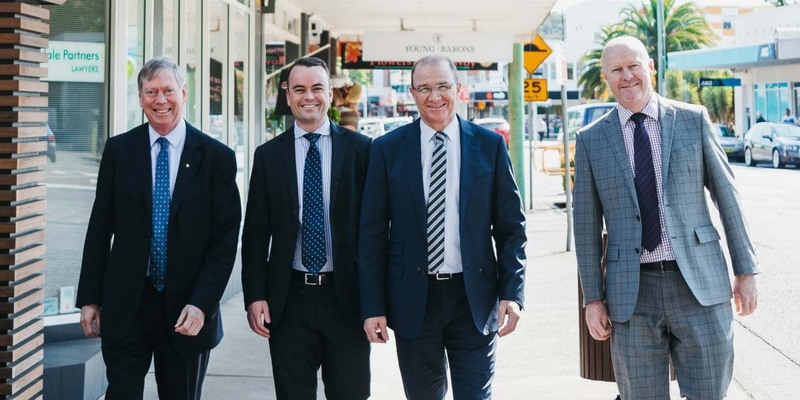 Tonkin Drysdale Partners has now grown to a team of more than twenty legal experts and is spearheaded by its four partners – Darrell Pannowitz OAM, Paul Tonkin, Paul Quinn and Lee Pawlak. Despite the enormous social, economic, cultural and technological changes over the past six decades, Tonkin Drysdale Partners has remained a constant supporter of the Peninsula community, keeping up with changing needs and demands whilst maintaining the core values in which it was founded. Managing Partner, Darrell Pannowitz OAM expressed the firm’s strong beliefs in client loyalty and community engagement, thanking those they have served over the past sixty years. “On behalf of the entire team at Tonkin Drysdale Partners, we’d like to give thanks to our loyal clients over the past sixty years,” said Mr Pannowitz. “We are very passionate about looking after our community and are proud to have built life-long relationships that transcend generations,” continued Mr Pannowitz. “Having worked in the business myself for 30 years, I have seen firsthand the benefit of supporting locals and families, representing people who now have children and grandchildren whom we now support,” he added. The history of Tonkin Drysdale Partners continues to evolve as the team take on new and younger associates who are passionate about empowerment of good legal representation. “We are pleased to continue the Tonkin family line of valued solicitors with Philip’s son Paul Tonkin a partner and grandson Dominic Tonkin now a solicitor. We are also proud to foster young associates, legal secretaries and solicitors whom are passionate about working in the industry and supporting Central Coast locals,” added Mr Pannowitz. Since its inception, Tonkin Drysdale Partners has fostered a strong sense of community spirit, giving back to a wide range of community causes and organisations including the Central Coast Mariners, Ocean Beach Surf Life Saving Club, Peninsula Villages, Everglades Country Club, as well as a range of sporting groups and not-for-profit organisations. “We take great pride in giving back to our community and it has been an honour to be involved with a number of great organisations. In the last 12 months alone, we have supported more than 30 organisations and initiatives,” said Mr Pannowitz. “We look forward to serving the community into the future with many more years to come,” concluded Mr Pannowitz. Tonkin Drysdale Partners provides legal services and advice across a broad range of fields including property conveyancing, litigation, estate planning, intellectual property as well as family, commercial, employment and criminal law.